I like to make Sunday lunch. It's one of the ways I like to show my husband that I love and appreciate him after he has taught three services at our church. I also like to have all of us eat together around the table, visiting, laughing, enjoying our bites, talking about our previous weeks, and getting our bearings for the coming week. I usually get home about 11:45 before the rest of my crew arrives around 12:30. And when they get home, they are starving. What is it about Sundays that make your stomach growl more than other days of the week? So I have a few quick meals that are not only perfect for Sunday lunch but also for busy weeknights when we're somewhere between school, track meets, baseball practice, board meetings, home group, football games, and the gazillions of other activities that Hannons are involved in. 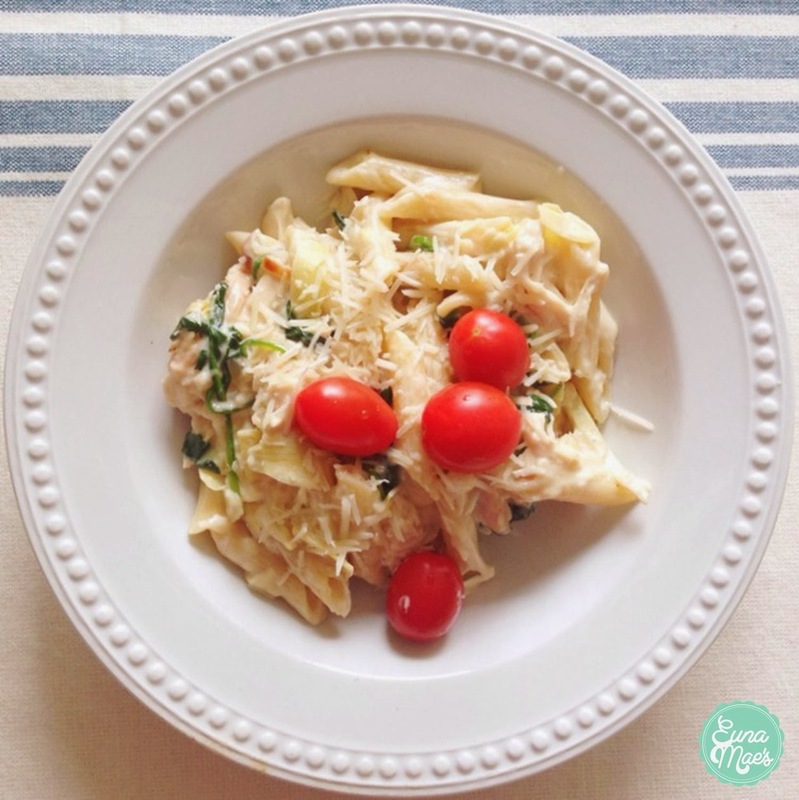 This spinach artichoke chicken pasta is one of our favorites. Inspired by my very favorite dish at a local Italian restaurant, this pasta is flavorful, hearty, and creamy, with freshness from lemon zest and a handful of grape tomatoes right on top. What makes this pasta dish so quick is that it is about 75% pre-made food that you just crack open and cook and about 25% fresh food that is easy to chop and toss in for big flavor. And it makes about eight good-sized bowls. Serve with warmed crusty bread and a salad, and you're all set with a beautiful meal on the table in a half-hour! And if you're lucky, you'll have a single size portion left for lunch the next day like I do today! So. Excited. Real quick before I post this semi-homemade recipe....There is a luscious homemade version of this dish that features homemade alfredo sauce with heavy cream, butter, lemon, and parmesan all thick and melty and divine. And you may also choose to roast your own chicken like I showed you here. On weekends I will make the entire homemade version of this dish - when I have the luxury of time and I'm just feeling the need to have my hands in every step. But for the sake of time and feeding hungry loved ones, this quick and easy 30-minute recipe is a dream! In a large pot, boil the pasta in salted water for 12 minutes until al dente. While the water is coming to a boil and the pasta is cooking, heat the butter and olive oil in a large saute pan or skillet over medium-low heat. Chop the onion and the garlic and give the drained artichokes a rough chop. Add the onion to the pan and saute for a few minutes until translucent and tender. Add the garlic and artichokes and saute, making sure the garlic doesn't burn. (It will burn if you look away and stop stirring.) Add the spinach stirring to wilt down. If you have to add it in two batches to make room, then that's fine. It will wilt down by more than half. Stir the onions, garlic, artichokes and spinach together well. Pour the the jars of alfredo sauce in the pan with the spinach mixture. Add a little of the pasta water to each jar, and shake with the lid on to remove the rest of the good sauce inside the jar; pour into the pan. Stir the sauce and the spinach mixture together until combined. Season with Tony Chachere's seasoning. (I use this seasoning in a lot lot LOT of dishes!) Bring to a low simmer and add the parmesan cheese (and capers if you wish), stirring well until the parmesan has melted and the sauce has come together. Reduce heat to low and cover. Check the pasta for doneness; it should be ready at this point to be drained. In your biggest serving bowl or mixing bowl, add the drained pasta, then pour the cream sauce over it and stir to combine. Remove the breasts from the rotisserie chicken and tear apart with your hands into pieces, adding to the bowl. Stir well. Zest one lemon over the pasta and stir once more. Serve in shallow pasta bowls with another sprinkle of shredded parmesan cheese and fresh grape tomatoes.